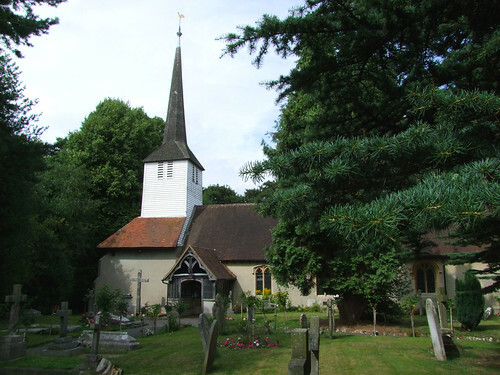 Although the combined town of Brentwood/Shenfield/Hutton has a population not far short of 100,000, This is a small rural church right on the edge of the conurbation and set in a pretty although overneat churchyard with woods beyond. The church is open every day, as the permanent sign outside makes clear. As you'd expect from a church serving an urban population it is entirely 19th century inside, but very pleasant nonetheless. The star feature is a terrific memorial of the Commonwealth period with the effigy of Elizabeth Robinson, a 15 year old girl holding a baby and a skull. She died in childbirth, the baby survived. The story goes that her father was a parliamentarian, her husband a royalist, but her death united the families. This seems a little unlikely in 1652, but it is a nice story. Some good Kempe and Powell glass, but in trying to be welcoming they keep all the lights on, which makes the glass rather hard to photograph. Some people were working on the bells, and it sounded very odd to hear them being tested in such a random and cacophonous manner - I rather liked it, it sounded like something you'd hear on Radio Three's 'Here and Now'.